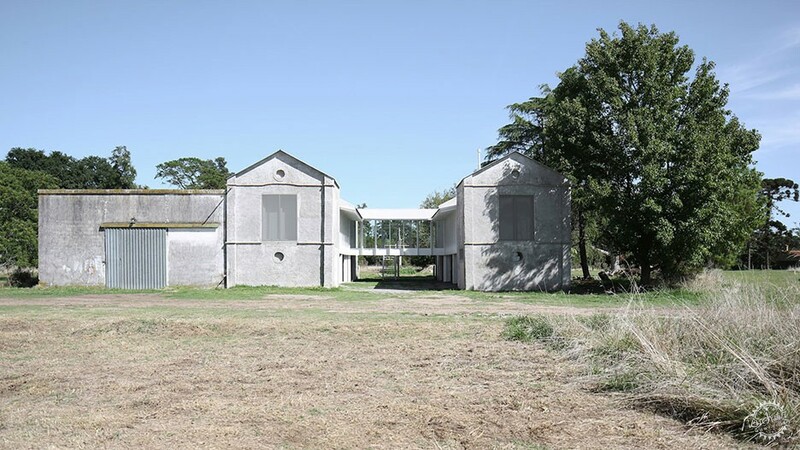 A pair of buildings once used to house bulls in rural Argentina have been transformed into a countryside home by architecture studio Adamo-Faiden. Located in Lobos, 60 miles south of Buenos Aires, the old agricultural structures were abandoned after advances in livestock production rendered them surplus. Adamo-Faiden, a studio led by architects Sebastián Adamo and Marcelo Faiden, were asked to convert it into a domestic space. 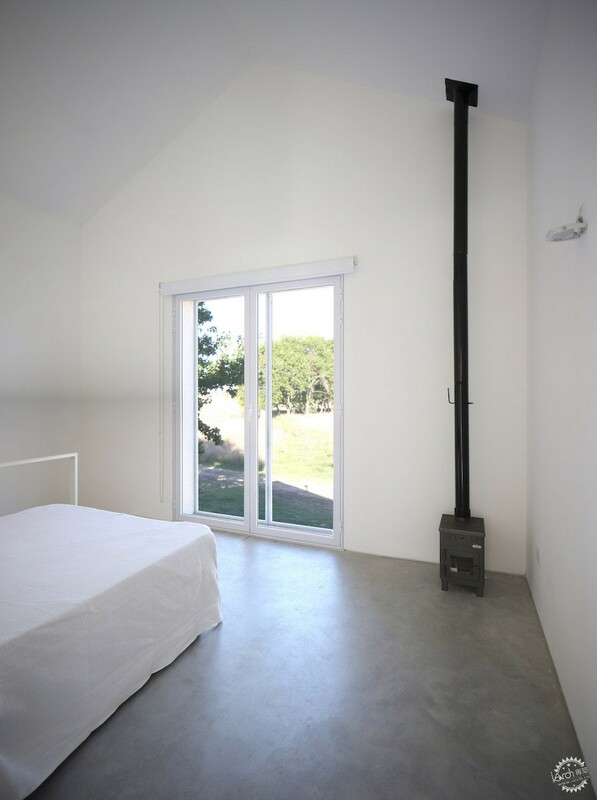 But the client requested for the building to remain in harnony with the rural landscape of its setting. 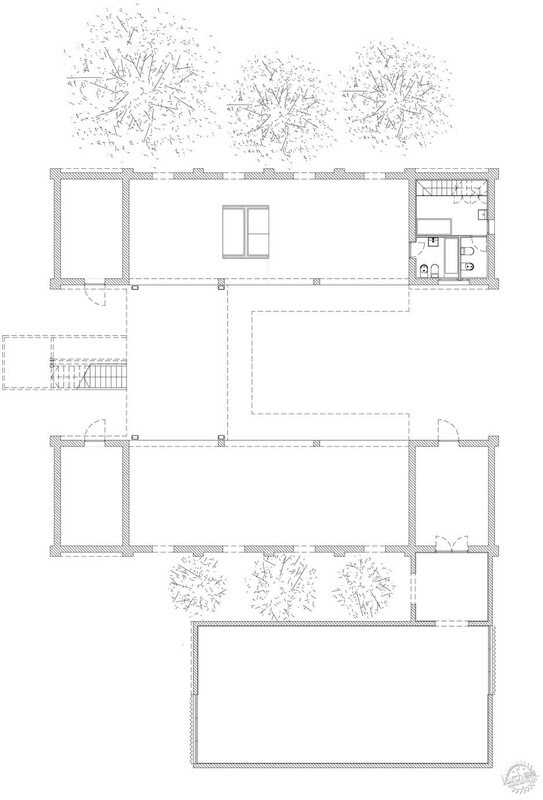 The result, Macchi House, was formed by linking the ends of the two original structures together above ground level to form what the architects describe as an "aerial patio". The U-shaped first floor is reached via a staircase that leads to the glazed gallery suspended between the conjoined buildings. Floor-to-ceiling glazing runs along the inner walls of the horseshoe-shaped home, making an overlooked courtyard space of the grassy area below. There are no walls dividing the aerial patio area, which is one continuous space with an open-plan kitchen at one end. A second staircase connects the ground floor at the corner nearest the kitchen. "The position of the staircase proposes a longitudinal circuit that ends in a viewpoint that precedes the entrance," said the architects. The most private rooms are built into the turrets at either end: a bathroom and three white-walled bedrooms. A new roof spans the U-shaped building, supported by rafters angled towards the centre. "A system of converging rafters links the structure of the new roof with the enclosure of the central space, producing a fluid spatial effect, a horizontal dialogue between present and past that invites us to imagine an open future for this intervention," added the architects. Buenos Aires-based Adamo-Faiden has garnered a reputation for beautifully adapting unused structures and spaces to create homes, often with clever introduction of glazing. 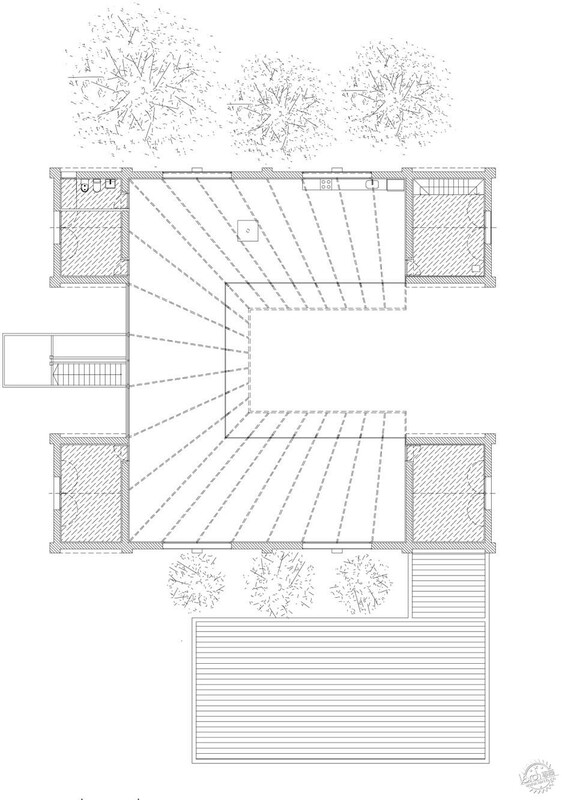 In Buenos Aires it added a greenhouse-like extension on the rooftops of three 20th-century houses to carve out more space for the residents below. 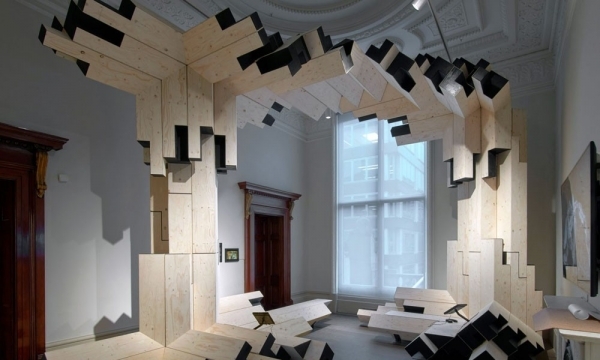 It also transformed the vacant roof of a 15-storey block into a home for a young couple by constructing a glass pavilion surrounded by foliage. For the refurbishment of a 1970s home in the city, the studio added a three level glass-and-white-frame extension at the back, creating a cage-like structure overlooking a swimming pool.